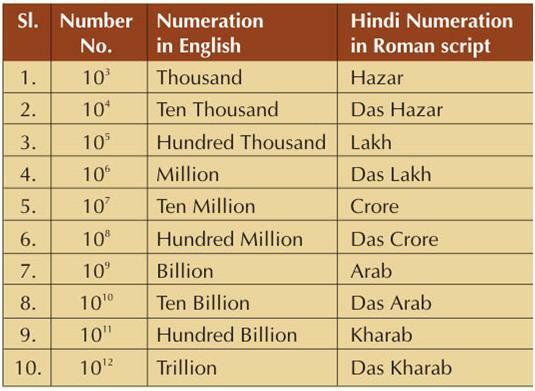 I know you’ll thank me for putting up this conversion table online for reference of all you desi-hood always confused over how much is a billion in crores and whether a million is Das Lakh or Ek lakh! I can relate to it myself and colleagues of mine in the office sometime I see grappling with a coversion issue in their language translation from Urdu to English or in reverse. It’s a fun sight you know. They go all around the office asking this person and reconfirming from another one. Actually there is seldom any re-confirmation if ever. Most of the times I see people frantically searching the net for an “authentic” source in order to officially report a conversion to a client or the media. I wonder if there is a website that compares numeral systems of various origins especially that of the West and South Asia i.e. India and Pakistan. Here is a start and I’ll try posting more relevant information and links when found. Meanwhile all the best with your conversions. Oh yeah with the authenticity of the table shared here; he he he he he…well I have used it in my official communications and has been correct all the time. See guys I have taken risks so that you desi-buds don’t have to bear no trouble no more..atleast not under a Trillion 😀 haar haar haar haar…no seriously go ahead and use the table with confidence! This entry was posted on Monday, November 10th, 2008 at 8:44 am and is filed under Integrate. You can follow any responses to this entry through the RSS 2.0 feed. You can leave a response, or trackback from your own site. Thank you for this table .Its a great help and i am no more confused with my conversions.I think it was very nice and considerate of you to put up this table online.